Too often, unused prescription painkillers and other drugs find their way into the wrong hands. That’s dangerous and often tragic. For anyone who has unused prescription drugs, there’s an opportunity for safe and anonymous disposal. 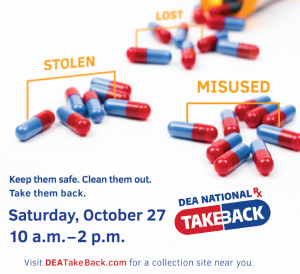 In coordination with the Drug Enforcement Association (DEA) National Prescription Drug Take Back Day, the Aitkin Police Department will be collecting unused, unneeded or expired prescription drugs at Riverwood Healthcare Center on Sat., Oct. 27, from 10:00 a.m. to 2:00 p.m. An Aitkin police officer will staff a table with a collection container in the main lobby. This entry was posted in News & Information and tagged Aitkin, DEA Take Back Day 2018, opioid abuse prevention, prescription drug disposal, Riverwood Healthcare. Bookmark the permalink.